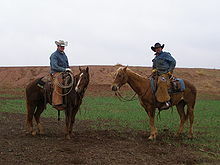 A cowboy is a person who rides horses. The cowboy got on his horse. This page was last edited on 10 November 2018, at 21:51.